Folks who play in a band or orchestras will be able to identify with the pain of carrying huge stacks of sheet music, and this is where the EMS concept comes in to save the day. 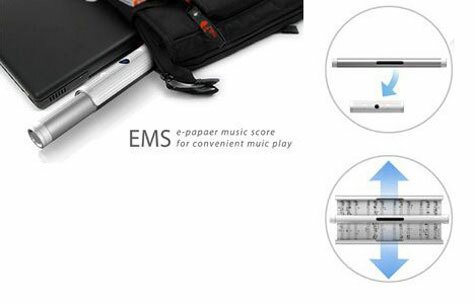 The EMS (E-paper Music Score) solves that mess by using E-paper technology. 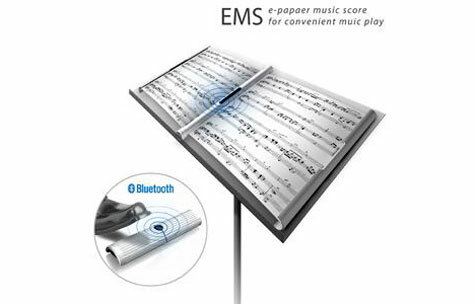 This single flexible screen can be unrolled and feed sheet music via bluetooth from a computer. A foot paddle turns the pages virtually, so you don’t have to constantly flip a page every few seconds. Design By Serina Sung.